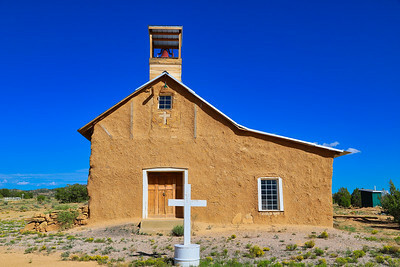 Religion is a major factor in New Mexico history. From the Native Americans to the Spanish who conquered and explored here to the Penitentes who believe in self-flagellation. I love finding old historical churches. Click to enlarge. 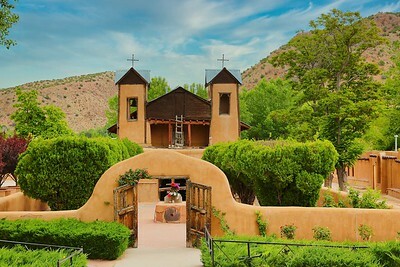 Considered one of the holiest places in North America, the Santuario de Chimayo in New Mexico is visited by hundreds of thousands who believe in the healing power of the dirt from this site. This church was built in 1810. 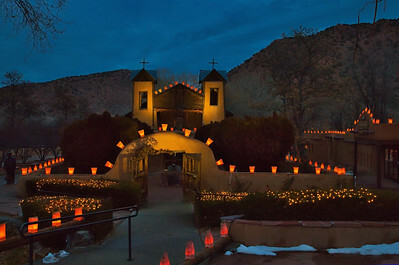 The Santuario de Chimayo is considered one of the holiest places in North America. It was built in 1810 and during the Christmas season they place the luminaries outside. 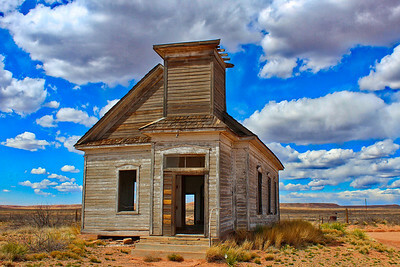 Just outside of Fort Sumner New Mexico (final resting place of Billy the Kid) lies the ghost town of Taiban. In the fall of 1908, construction began on the First Presbyterian Church of Taiban. It was completed on December 22, 1908, and the last sermon was held in 1936. Just outside of Fort Sumner New Mexico (final resting place of Billy the Kid) lies the ghost town of Taiban. In the fall of 1908, construction began on the First Presbyterian Church of Taiban. It was completed on December 22, 1908, and the last service was held in 1936. 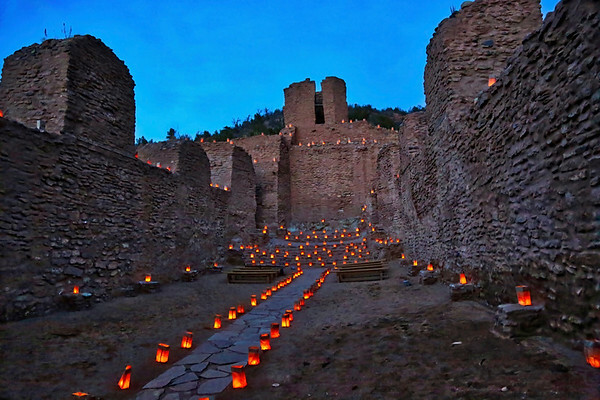 Luminarias (farolitos) light up the Jemez Historic Site ruins. The Jemez National Historic Landmark is one of the most beautiful prehistoric and historic sites in the Southwest. 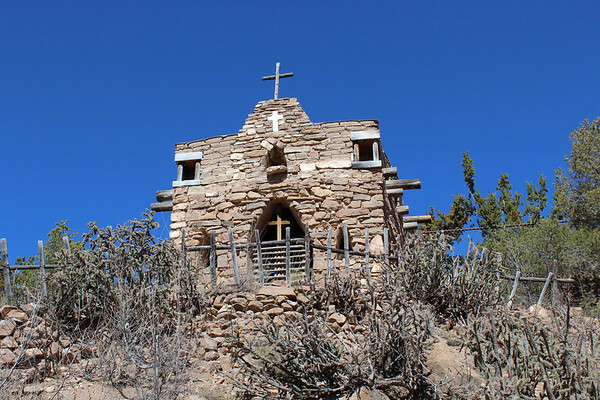 It includes the stone ruins of a 500 year old Indian village and the San José de los Jemez church dating to 1621. In the 17th century, the Spanish established a Catholic mission at the village. The mission was short-lived, and, in time, the people abandoned the site and moved to the current location of Jemez Pueblo. The massive stonewalls were constructed about the same time the Pilgrims landed at Plymouth Rock. A luminaria or farolito is a small paper lantern (commonly a candle set in some sand inside a paper bag) which is of significance in the US state of New Mexico in southwest United States at Christmas time, especially on Christmas Eve. They are said to light the way for the Christ Child. 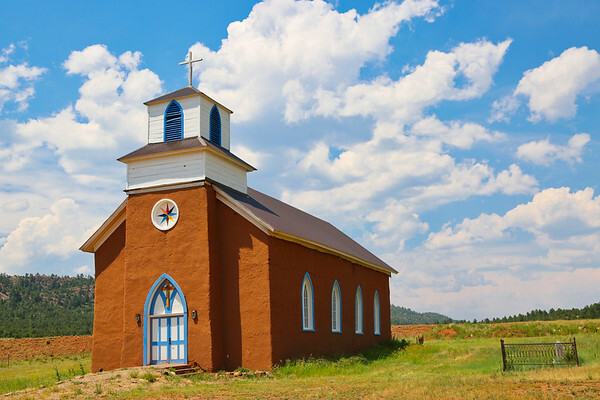 This Gothic style church appears a bit out of place in NM but that is part of its charm. Built in 1870 and located in La Cueva, NM. 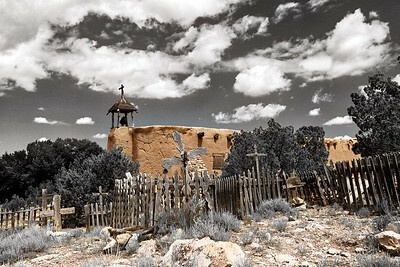 The La Morada de Nuestra Senora de Dolores del Alto de Abiquiu in Abiquiu, NM. The Penitentes are a semi-secret sect of the Catholic Church in northen New Mexico and southern Colorado. The full name is Los Hermanos de la Fraternidad Piadosa de Nuestro Padre Jesus Nazareno, "The Brothers of the Pious Fraternity of Our Father Jesus of Nazareth". This society has had a strong influence on the culture and beliefs of the small villages and towns of the Upper Rio Grande Valley. The roots of the Penitentes goes back about 800 years ago to Spain and Italy. Members practice self-flagellation and other forms of physical torment as penance for their sins. The Penitentes have been in New Mexico for over 400 years. This Morada was built in 1820 and is still used by the Penitentes in this area. 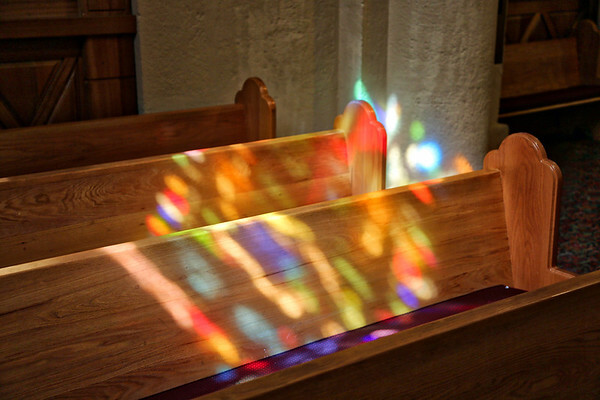 The light shines through the stained glass in the Cathedral Basilica of Saint Francis of Assisi in Santa Fe and hits the pews and making this gorgeous kaleidoscope. The Cathedral Basilica of Saint Francis of Assisi, commonly known as Saint Francis Cathedral, is a Roman Catholic cathedral in downtown Santa Fe, New Mexico. It is the mother church of the Archdiocese of Santa Fe. The cathedral was built by Archbishop Jean Baptiste Lamy between 1869 and 1886 on the site of an older adobe church, La Parroquia (built in 1714–1717). 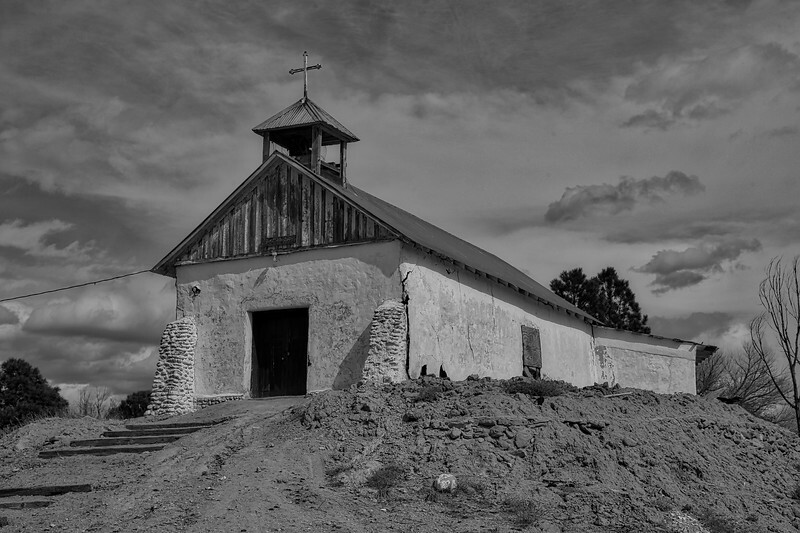 An older church on the same site, built in 1626, was destroyed in the 1680 Pueblo Revolt. The Penitente Morada door in Truchas, NM. This tiny chapel (Capilla in Spanish) is hidden away inside a residential section of Santa Fe. Built in the late 1700's in the tiny village of Colonias, NM, the San Jose Church is currently undergoing renovation. 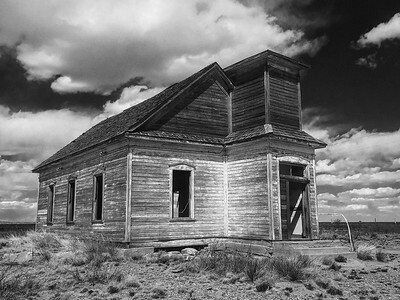 The graveyard holds centuries of residents of this tiny almost ghost town. 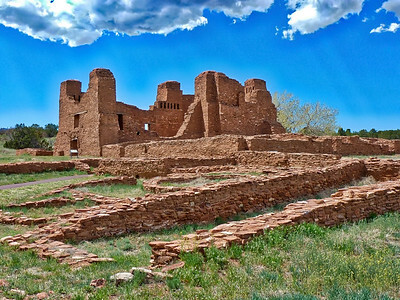 The Quarai ruins are located in central New Mexico and are part of the Salinas Pueblos National Monument. 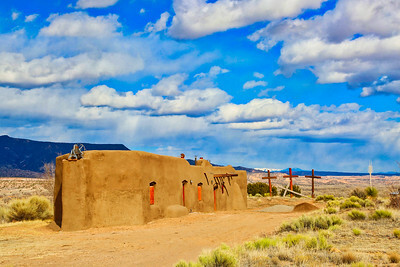 The largest features of the ruins are the main pueblo and the walls of the mission church, which was probably one of the largest wall and beam structures in North America. The walls range in thickness from three to six feet, and probably reached a height of 40 feet (12 m). The Quarai were a Pueblo band of American Indians. Based on the archaeology of the site, they are estimated to have settled here around 1300 AD. By the early 17th century the large pueblo compound had been built. Spanish missionaries were received by the Quarai in 1626, and granted permission to build a mission. Named Nuestra Senora de la Purisima Concepcion de Quarai, it was completed in 1632. Although the community did well, a severe drought afflicted the region beginning in the late 1660s, which combined with attacks from hostile Aztecs to lead to its abandonment in 1675. 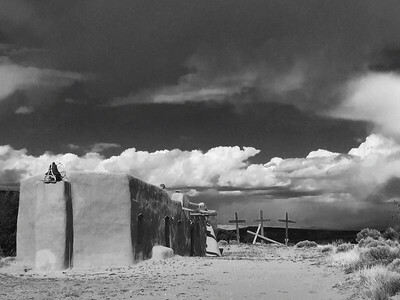 The Penitente Morada in Abiquiu. 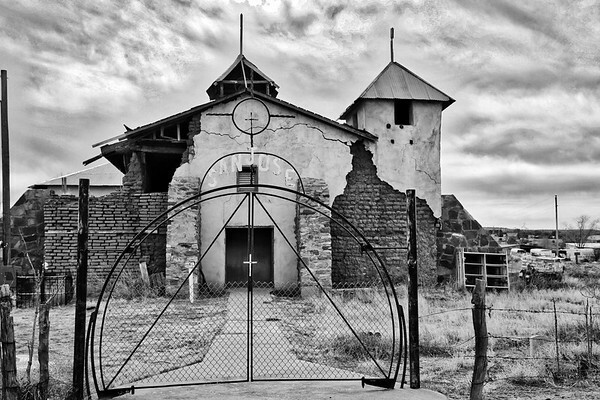 One of the most mysterious religious buildings in NM. This Morada was built in 1820 and is still in use today. On a hill stands the adobe Morada de la Conquistadora, a Penitente meeting house, which overlooks the living history museum of el Rancho de las Golondrinas (Ranch of the Swallows) on the historic El Camino Real (The Royal Road) near Santa Fe New Mexico. 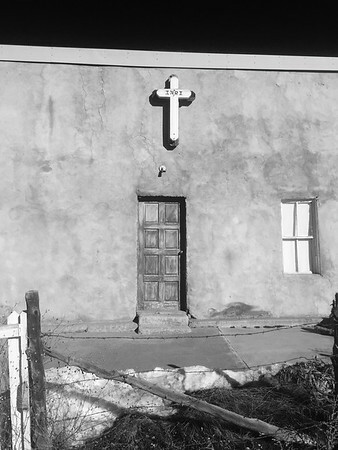 A Morada, meeting place for Penitentes, stands in small community in western New Mexico. The Penitentes have been in New Mexico for around 400 yrs and believe in self-flagellation as a penance for their sins. A very old Morada in La Puebla, New Mexico.